I was born in Havre de Grace, Maryland. I went to college in the Midwest. When I graduated, I moved to Boston because some friends were moving there. I worked in computers, first as a systems analyst at Instrumentation Laboratory in Lexington and later in the Sloan School at MIT. After a few years, I took a PhD in Philosophy at the University of Massachusetts Amherst. My first academic jobs were visiting positions. I was a Visiting Assistant Professor at North Carolina State University for two years and at Arizona State University for two years. My first permanent position was at Temple University. After three years, I was promoted with tenure to Associate Professor. I did not like living in Philadelphia, so in the year I was promoted I took a reduction in rank and returned to Arizona State University as an Assistant Professor. (Arizona is beautiful, and in those days there was more desert and fewer people. Plus, I had made friends in Tempe.) Two years later, I was tenured and promoted to Associate Professor for a second time. PHI 319: Philosophy, Computing, and Artificial Intelligence. An introductory study of logical techniques to model intelligence. PHI 328: History of Ancient Philosophy. An introduction to ancient Greek philosophy from 585 BCE to 529 CE. PHI 333: Introduction to Symbolic Logic. An introductory study of symbolic techniques to represent statements and arguments. PHI 420: Topics in the History of Ancient Philosophy. Plato's Republic and Aristotle's Nicomachean Ethics. Free will in ancient thought. 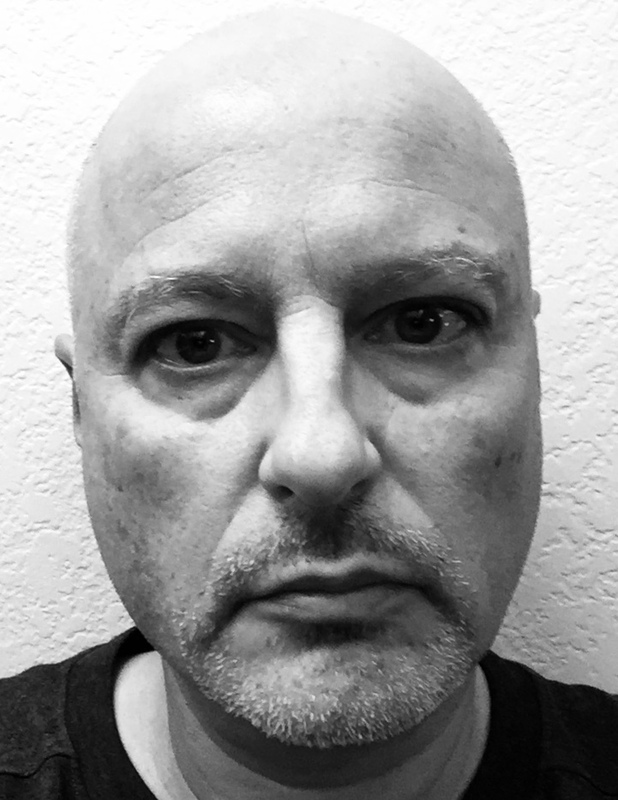 PHI 420 (Plato's Republic and Aristotle's Nicomachean Ethics) My research interests are primarily in ancient philosophy, although I have occasionally published work in epistemology and in other areas of contemporary philosophy. "The Clitomachian and Philonian/Metrodorian Justifications of Academic Assent." "Plato (ca. 427-ca. 347 B.C. ): Apology of Socrates." AUTOBIOGRAPHY/AUTOFICTION. An International and Interdisciplinary Handbook. Volume III: Exemplary autobiographical/autofictional texts. Edited by Martina Wagner-Egelhaaf. De Gruyter, Berlin, 2019. (Submitted 2013.) [abstract] I consider the possibility that the Apology is a work of autofiction. Autofiction is a genre in which the author tries to bring out something important about a person or a series of events that the author witnessed, but that the reader would miss in a straightforward historical account. My focus is on Apology 29c-30b, where Socrates explains what he will not stop doing. The History of Evil, Volume 1: The History of Evil in Antiquity. 2000 BCE-450 CE (edited by Tom Angier), 163-174. Routledge, 2018. (Submitted 2012.) [abstract] Epicurus did not discuss evil as theological problem. He was interested in the practical problem of living well, and it is in this connection that Epicurus made a lasting contribution to understanding evil and its causes. He rejected the dominate line of thought from the classical tradition of Plato and Aristotle. Epicurus was an empiricist, not a rationalist. From within this perspective, he developed a new understanding of the good life. 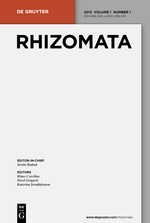 Rhizomata. A Journal for Ancient Philosophy and Science, 9 (2017), 91-112. [abstract] In the secondary literature, there are two interpretations of how the Stoics understood impulsive impressions in adults: what I call the "form" interpretation and the "no-form" interpretation. Brad Inwood and other historians argue for the form interpretation on the basis of Stobaeus' account of Stoic ethics. I argue that these arguments for the form interpretation are not sound and that the passages in Stobaeus provide no reason to believe that the form interpretation is more plausible than the no-form interpretation. "The Stoic Explanation for the Origin of Vice." Méthexis: International Journal for Ancient Philosophy, 29 (2017), 121-140. [abstract] The Stoics thought that once human beings become rational, they immediately form false beliefs about what is good and what is bad. There are no exceptions. Even the sage once had false beliefs about the value of things. The dispute among the Stoics was not about whether this happens, but was about how to explain the reasoning that results in these beliefs. The primary evidence for this dispute is Galen's discussion in On the Doctrines of Plato and Hippocrates. On the basis of this discussion and certain assumptions about how the Stoics understood impulses in the psychology of children and adults, I set out an interpretation of (i) Chrysippus' explanation of what happens at the onset of reason when human beings form false beliefs about what is good and what is bad, (ii) Posidonius' criticism of this explanation of the origin of vice, and (iii) the explanation that Posidonius himself thought was correct. The Review of Metaphysics, 70 (2016), 59-86. [abstract] According to the Stoics, human beings enslave themselves. When they change from nonrational children into rational adults, human beings form false beliefs about what is good and what is bad. These beliefs enslave them to things that are neither good nor bad. I argue for an interpretation of how the Stoics understood the reasoning that results in these false beliefs. This interpretation helps makes sense of the argument against Chrysippus's explanation of the origin of vice that Galen attributes to Posidonius. It also helps explain how the Stoics could think that nature is provident and that nature constructs human beings so that they enslave themselves when they change from nonrational children into rational adults. "Against Weatherson on How to Frame a Decision Problem." Journal of Philosophical Research, 41 (2016), 69-72. [abstract] In "Knowledge, Bets, and Interests," Brian Weatherson makes a suggestion for how to frame a decision problem. He argues that "the states we can 'leave off' a decision table are the states that the agent knows not to obtain." I present and defend an example that shows that Weatherson's principle is false. "Two Interpretations of Socratic Intellectualism." Ancient Philosophy, 35 (2015), 23-39. [abstract] Among historians of philosophy, Socratic intellectualist psychology has been understood in at least two ways. On one way (the D interpretation), all action is a matter of a fixed desire for the good and belief about what the good is. On another interpretation (the B interpretation), all action is completely a matter of belief. I argue for the B interpretation of Socrates' intellectualism in the Protagoras. This makes good on endnote 12 on page 68 of Ancient Greek Philosophy where I endorse the B interpretation without much argument. Philosophical Studies, 159 (2012), 277-291. [abstract] I argue for an alternative interpretation of some of the examples Fred Feldman uses to establish his theory of happiness (in Pleasure and the Good Life (OUP, 2004) and What is This Thing Called Happiness? (OUP, 2010)). According to Feldman, the examples show that certain utterances of the form 'S is pleased/glad that P' and 'S is displeased/sad that P' should be interpreted as expressions of extrinsic attitudinal pleasure and displeasure and hence must be excluded from the aggregative sum of attitudinal pleasure and displeasure that constitutes happiness. I develop a new interpretation of Feldman's examples. This interpretation allows the attitudinal hedonist to preserve the idea that happiness is simply a matter of the attitudinal pleasure and displeasure in one's life and that all attitudinal pleasure and displeasure counts equally in the aggregation that constitutes happiness. 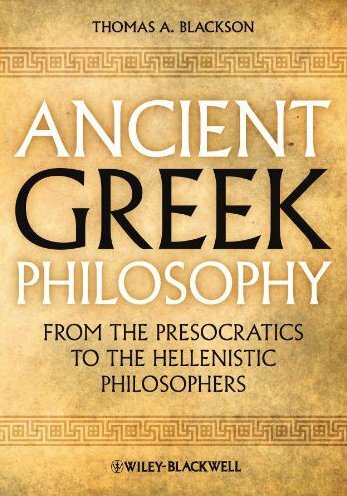 Ancient Greek Philosophy: From the Presocratics to the Hellenistic Philosophers. Wiley-Blackwell, 2011. [abstract] I wrote this book to solve a problem. It seemed to me, when I was teaching ancient philosophy, that my students did not want to spend all their time taking notes. They wanted to listen and think about the material, and they wanted to take part in a discussion. For this to be possible, they must have some understanding of the material prior to class. The problem is how to give the students this understanding. The standard scholarly works provide explanation, but it is the wrong kind of explanation for beginning students. These works are narrowly focused on a period within the history or on a specific text. Beginning students find such detailed analysis and argument difficult to comprehend because so much of it presupposes a general understanding of the historical figures and lines of thought that define the ancient philosophical tradition. The standard anthologies are the traditional alternative, but they do not provide enough explanation for beginning students. They provide brief introductory remarks, and these remarks are almost always too brief to provide the understanding beginning students need. What students need is an explanation of the lines of thought that define ancient philosophy and in terms of which it develops. This is what I tried to provide. "Early Work on Rationality: the Lorenz-Frede Interpretation." 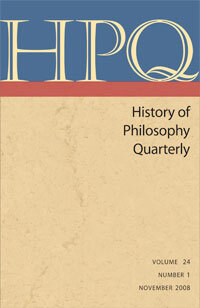 History of Philosophy Quarterly, 27 (2010), 101-124. 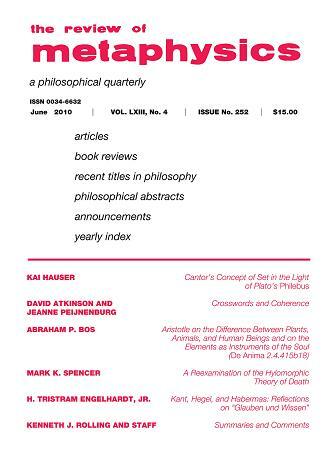 [abstract] In The Brute Within (OUP, 2006), Hendrik Lorenz tries to incorporate Plato's Tripartite Theory of the Soul within the framework of the ancient Rationalist/Empiricist tradition that Michael Frede outlined in a series of papers. To correct what I believe is a mistake in Lorenz's interpretation, I consider certain passages in the Gorgias in which Socrates discusses the kind of cognition he calls "experience." I argue that these passages strongly suggest that Plato, in the Republic, in the Tripartite Theory, allows for action to be completely a matter of the appetite and spirit, with reason playing no role whatsoever. 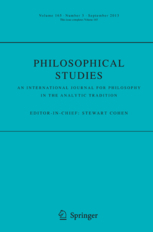 Further, given my interpretation of the Tripartite Theory, I note that there is a clear connection between Plato's work in understanding the Socratic claim that human beings are psychological beings and contemporary work in philosophical psychology according to which cognitive behavior can be rational even though no part of this behavior depends on an instance of reasoning. Plato was the pioneer in the development of this idea, and Lorenz's interpretation unnecessarily obscures this fact. "On Feldman's Theory of Happiness." 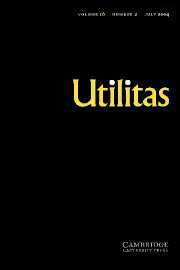 Utilitas, 21 (2009), 393-400. [abstract] In Pleasure and the Good Life (OUP, 2004), Fred Feldman argues that there is a propositional attitude (he calls "attitudinal pleasure/displeasure") expressed in ordinary uses of sentences of the form 'S is pleased/displeased that P.' He distinguishes intrinsic from extrinsic attitudinal pleasure and displeasure, and he excludes extrinsic attitudinal pleasure/displeasure from the aggregation of attitudinal pleasure/displeasure that constitutes happiness. I argue that Feldman has not made a strong case for this distinction and exclusion. "On Williamson's Argument for (Ii) in his Anti-luminosity Argument." Philosophy and Phenomenological Research, 74 (2007), 397-405. [abstract] Williamson's anti-luminosity argument depends on what he says is an "intuitive" connection between knowledge and reliability. (Knowledge and its Limits (OUP, 2000), 100.) I believe that the connection is "intuitive," although this can take some time to see, but I argue that this "intuitive" connection is not sufficient to support (Ii) in his anti-luminosity argument. Williamson's argument against luminosity is not sound. "Induction and Experience in Metaphysics A1." "In Defense of an Unpopular Interpretation of Ancient Skepticism." 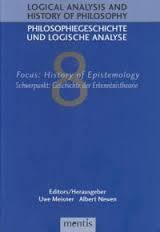 Logical Analysis and the History of Philosophy: History of Epistemology, 8 (2005), 68-81. [abstract] The subject of this paper is the history of late Academic Skepticism and its connection to the emergence of Pyrrhonian Skepticism. The two main ways to understand this period in history are anthologized in The Original Sceptics: A Controversy (Hackett Publishing Company, 1977), edited by Myles Burnyeat and Michael Frede. To many, Frede's position has been less convincing to many than Burnyeat's. Frede argues that life without belief was not a fundamental feature of Pyrrhonism. Frede presents his arguments somewhat confusingly, which has made his interpretation difficult to appreciate, but I argue that there is more to be said for Frede's interpretation than has been thought. 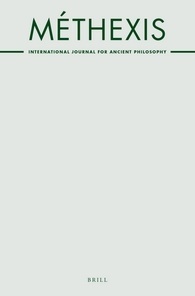 I argue that Frede's interpretation, when properly understood, shows that the ancient skeptics in the Clitomachian-Pyrrhonian tradition are fallibilists who took the first steps in working out the view that epistemic justification is a matter of whether a belief is the outcome of a correct cognitive process and that correctness here need not be understood in terms of a reliable connection to truth. "An Invalid Argument for Contextualism." Philosophy and Phenomenological Research, 68 (2004), 344-345. [abstract] In "Assertion, Knowledge, and Context" (Philosophical Review, Vol. 111, No. 2 (April 2002), 167-203), Keith DeRose offers the following argument for contexualism: "The knowledge account assertion provides a powerful argument for contextualism: if the standards for when one is in a position to warrantedly assert that P are the same as those what comprise a truth-condition for 'I know P,' then if the former vary with context, so do the latter. In short: The knowledge account of assertion together with the context-sensitivity of assertability yields contextulaism about knowledge" (187). I show that this argument is invalid.